Mister Rogers arrives with a platform rocking chair. He shows how it acts as a rocking chair while sitting atop a platform that does not move. With the help of Picture Picture, Mister Rogers shares a film about the woodworker who made the chair. In the Neighborhood of Make-Believe, Paul and Pauline Purple demonstrate for Cornflake S. Pecially the Purple way of traveling. They share with him that rocking chairs do not exist on Planet Purple and that those who live there are not permitted to rock in chairs. When Purple Panda sits in one of Corney's chairs, his punishment is banishment from Planet Purple. For the time being, Purple Panda is invited by Lady Aberlin to stay at the castle. Back at the house, Mister Rogers sits in the platform chair and sings You Are You before visiting Chef Brockett's Bakery. 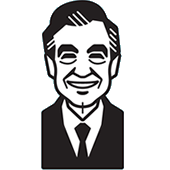 The bakery's soda shop is very busy and full of customers so Mister Rogers offers his assistance by making butterscotch sundaes, root beer sodas, and ice cream cones. With everyone enjoying the treats they ordered, Mister Rogers washes the dishes and returns to his house. 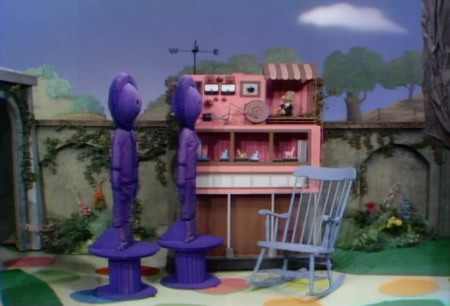 Throughout their appearance in the Neighborhood of Make-Believe, the platforms under Paul and Pauline Purple can be seen. These platforms likely operated on a swivel which allowed for the characters' back-and-forth movement as they spoke. Punishing Purple Panda, Paul and Pauline repeated the word "sixteen." According to them, "sixteen is the punishment when a rule is violated." 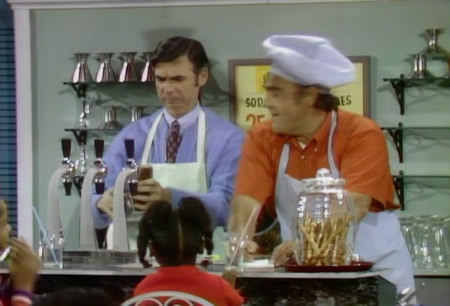 Manning the soda fountain, Mister Rogers accidentally makes a chocolate sundae when a butterscotch sundae was ordered. Eventually he eats the chocolate sundae himself. Also, as he fills a glass with root beer, the drink unexpectedly sprays from the fountain. Mister Rogers and Chef Brockett mention how much they miss Mrs. Schenk, a former employee of Brockett's Bakery.